First thing’s first, this is not a healthy recipe. You can of course change out certain ingredients with healthier options, but that is not recommended. White bread is superior to wheat, and don’t even get me started on turkey bacon. If you are looking for a new way to spice up your Sunday brunch, look no further. 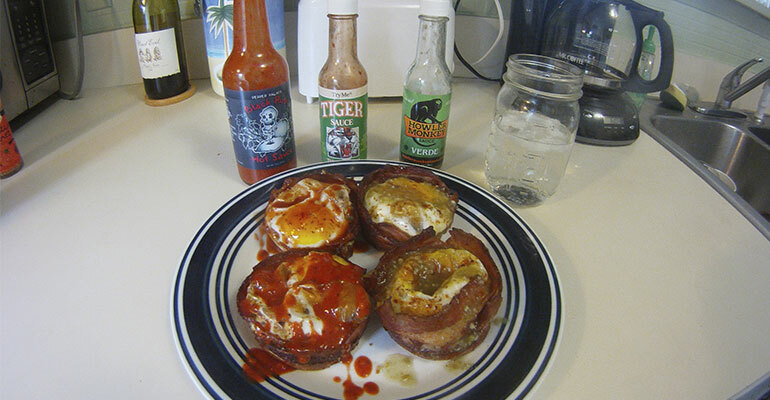 Brunchcakes are essentially a bread based, bacon wrapped, vegetable filled, egg topped, lap dance on your tongue. 1 Pack of Bacon, 6 Eggs, Butter, Sliced Bread, Cast Iron Skillet, Muffin Pan, 1 Green Bell Pepper, 1 Jalapeno Pepper, 2 Cloves of Garlic, Hot Sauce(s) of Choice, Seasoning(s) of Choice, Cocktail(s) of Choice. Let’s start by preheating your oven to 400 degrees. Dice the veggies you want to use inside your brunchcake. For this round, we went with Green Bell Peppers, Garlic, and Jalapeno Peppers. You’ll want to adjust the amount of veggies you use for the amount of Brunchcakes you plan to make. For our 4 that we made, the ingredients above worked perfect. Find a cup that best fits inside the base of the muffin pan. We found that a small mason jar worked perfect for this! Take a couple slices of bread and punch out round circles of bread and place in the base of the pan. Cut bacon into halves and cook over medium heat, but only HALF WAY! You still want it to be a little tender and undercooked as we are going to be baking it for a little longer. Usually here is where a normal recipe would say to drain the grease. Don’t You Dare! Leave that savory pig juice in your skillet and saute your veggies of choice in the remaining bacon grease with a tablespoon of butter. Line each muffin cup in the pan with the delicious strips of pig belly. This creates the outside of the Brunchcake and keeps all of the insides in. Then add your sauteed veggies to the center of each cup (it’s starting to look pretty damn good already). Crack an egg into each muffin cup, add your seasoning of choice, and then place in the oven at 400 degrees for 20 min. We covered ours with a special home made Cajun Ghost Pepper seasoning. Pour yourself a cocktail. You deserve it for one of two reasons. One, you’re about to devour one of the most delicious breakfast meals ever. Two, it’s brunch, you should be drinking already! After your oven timer rings, that’s it! Just remove them from the pan, cover in your favorite hot sauce, and enjoy! If you are having any trouble removing them from the pan, we found that a tablespoon worked well to get em out easily. One of the things I love most about this recipe is that there are an unlimited number of combinations you can create with it. Try a different bacon, maybe maple, or hickory smoked. Try a different combination of veggies, a different type of bread, or seasonings, or sauces. You could make a different one of these every day and never have the same one until you die of either old age, heart attack, or protein overdose. As far as sauces go, we went with the Original Tiger Sauce from TryMe, the Verde from Howler Monkey, and the Black Rose sauce from the Pepper Palace. We hope you enjoy these as much as we did! I do owe some credit to the guys at quickmeme for inspiring this. Have you created your own version of these? Let us know how you did it in the comments below! All photos taken with my GoPro Hero 3.